We're excited about helping you wrangle up all that frizz! Whether you have virgin/resistant hair, colored/chemically treated hair, highlighted porous, or fine hair, we've got the right formula of Chi Enviro American Smoothing Treatment just for you. Take a look at this actual photo and you'll see how well the Frizz goes away. Before any treatment. Is it humid in here? After hair smoothing with Chi Enviro and a flat -iron. Amazing. 2 weeks later and still no frizz! Client said this was quick and easy to smooth with only blow-drying with a round brush. There was no need to flat iron. Wow. Still not sure? 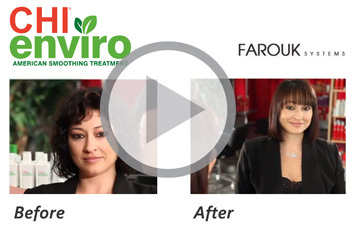 Take a look at the Chi Enivro video to learn more about how we'll cure you of the frizzies.